While waiting to be paid for his latest job, a hired killer befriends a motel manager. Have you ever watched a movie and come away wishing it had focussed its attention on one of its supporting characters? That's the feeling I had after viewing director Jamie M Dagg's Alaska set, noirish, contemporary western Sweet Virginia. Dagg's film opens with a moment of seemingly spontaneous violence, as a young man guns down three poker players after hours in a diner. We soon learn that the killing was premeditated. Well, not quite. The perpetrator, Elwood (Christopher Abbott), was hired to kill just one of the men, but decided it was easier to remove any loose ends. His employer is Lila (Imogen Poots), who promised Elwood $50,000 to murder her husband. Lila intends to pay Elwood out of the insurance money she expects to receive from her hubby's death, but it turns out her other half was keeping his dire financial state a secret, and not only is Lila left out of pocket, but the bank is set to take her home. With a violent hitman expecting a cash payment, what's the desperate Lila to do? With this intriguing setup, you would expect Lila to be the central protagonist of the story, but Dagg's film, penned by brothers Benjamin and Paul China, instead averts its gaze onto Sam (Jon Bernthal), a former rodeo star who now manages the motel Elwood is holed up at. While waiting for Lila to rustle up his fee, Elwood makes friends with the shy Sam, the two men awkwardly bonding over their Virginia backgrounds. Meanwhile Sam is romantically involved with Bernadette (Rosemarie DeWitt), the widow of one of Elwood's victims. As thrillers go, Sweet Virginia is commendably invested in exploring the psychology of its characters. Though the four main players are caught up in a typical genre narrative, every member of the quartet feels like a genuine person, and we empathise with them all to varying degrees. Continuing the trend set by Willem Dafoe in The Florida Project, Sweet Virginia casts another actor known for playing villains as a kindly motel manager, and gives Bernthal his finest role to date. His Sam is the closest the film has to an out and out upright citizen, though he tortures himself for his role in his affair with Bernadette. Limping from an injury sustained during his rodeo days, he resembles one of those great broken down protagonists from a Sam Peckinpah movie. Bernadette is perhaps the most morally complex of the quartet, confessing she was unable to shed a tear over her husband's death. The film never paints her deceased spouse in a bad light, which adds to the pathos of the scenario and Sam's moral conflict. Though she is responsible for the deaths of three men, it's difficult not to empathise with Lila, who seems to be keeping secrets about her husband's treatment of her. Even the sinister Elwood is sympathetic to a degree, a socially awkward loner who makes long distance phone calls to his mother and has an attack of conscience late on, even though it could prove his downfall. While Dagg's film may work better as a character study than a thriller, that's not to say it doesn't offer its share of thrills. Dagg fashions a couple of genuinely nail-biting sequences, with an extended scene in which Lila grows increasingly paranoid about the car that appears to be following her the highlight. Overall, Lila is sadly short-changed, fading into the background to such a degree that it almost feels like much of her footage was left on the cutting room floor, and at several points you may find yourself asking "What's Lila doing right now?". I certainly found myself puzzled as to how someone like Lila came into contact with a hired killer in the first place. 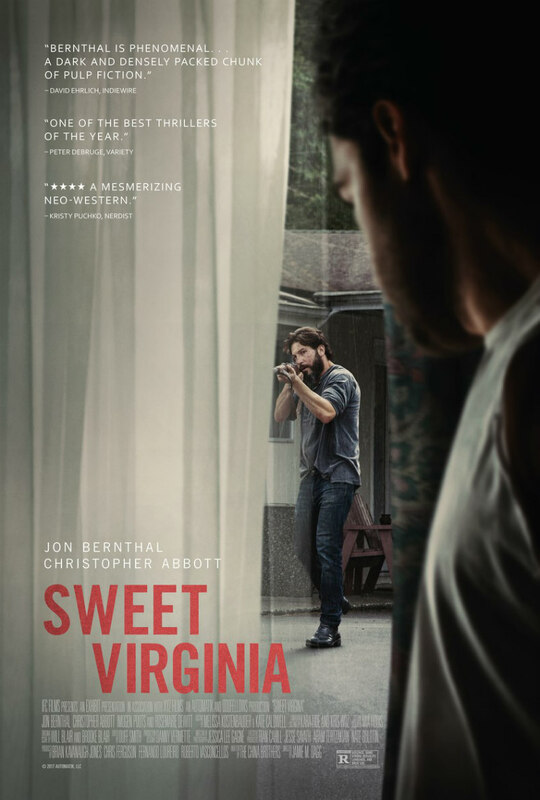 Sweet Virginia is one of the most engrossing thrillers of recent years, but had it taken more time to explore the emotional turmoil and existential terror experienced by Lila, it really could have been a modern classic. It seems an odd complaint in this era of bloated runtimes, but Sweet Virginia could have benefitted from another 30 minutes. Sweet Virginia is in US cinemas November 17th. A UK/ROI release has yet to be announced.